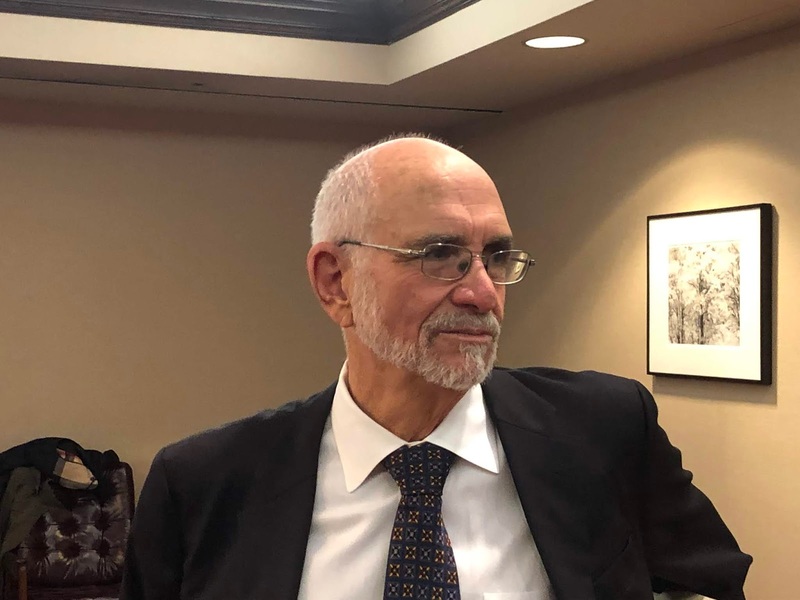 Southern California Appellate News: CAP Captain retires after 30 years! CAP Captain retires after 30 years! GUARDIAN of the SIXTH AMENDMENT GALAXY! Jon Steiner, the Executive Director of CAP/LA was feted yesterday at the 2d District Court of Appeal to honor his retirement after 30 years of amazing service. APJ Lui, retired justice Chuck Vogel, and Managing Attorney Tom Kallay presented moving remarks and cake and cider were enjoyed by all! The Los Angeles office of the California Appellate Project (CAP/LA) is one of six appellate projects in the state. It has, for 32 years, managed, supervised, and provided constitutionally-mandated quality control oversight for the court-appointed counsel system in the Second Appellate District. The appellate court-appointed counsel system affords representation to indigent clients in criminal, child welfare (“dependency”), juvenile justice (“delinquency”), and other cases (including mental health) in which the client qualifies for a court-appointed attorney. CAP/LA is not a state agency. It is an independent non-profit 501(c)(3) public interest law firm with a board of directors. The work is specified in a contract with the Judicial Branch, which is entirely responsible for CAP/LA’s funding. CAPLA has been an indispensable member of the 2nd District Court of Appeal family for over 32 years, partly because of the vision of Justice Arleigh Woods, and the perseverance and efforts of Tom Kallay, the creator and the original executive director of the CAPLA office. Then, 30 years ago, Jon Steiner, took the helm, and developed the office to its full potential. With its 21 in-house staff attorneys providing peer review and quality control for about 3000 new cases every year, the office now oversees about 5000 open cases at any point in time—criminal, juvenile justice, child welfare, mental health, and any others where the client is indigent and has a right to appointed counsel. CAPLA works with, trains, and assists about 450 private attorneys on about 90% of the cases and handles about 10% of the cases in house with its exceptionally experienced staff attorneys. One part of CAP’s dual mission is making sure indigent clients receive competent representation. This leads to the second part of the mission, that is, making sure the court receives useful briefing, a benefit the court has enjoyed and has appreciated for over three decades. The court also appreciates CAPLA’s meticulous review of all claims for compensation of the private attorneys, using guidelines developed by the APJs and the Chief Justice, a time-consuming and difficult process the justices had previously had to perform themselves without the carefully crafted criteria developed by CAPLA. Finally, CAPLA has always been available to answer questions and to jump in and help solve problems whenever the justices or clerks of the court ask. Jon’s relationships with court personnel and his exceptionally high standards have been instrumental in creating a strong professional and respectful association between CAPLA and the Court and making California’s Court Appointed Counsel system in the Second Appellate District work uniquely well.